One of the nation’s first programs to bring full time Hip Hop education to high school students seeks new partners after financial crisis terminates its 5-year run. 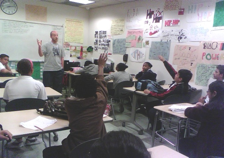 Los Angeles, California, February 2011 – Since 2006, The Global Awareness through Hip Hop Culture program has been at the forefront of legitimizing the use of Hip Hop culture in mainstream education. Based at a charter school in South Los Angeles, it has been one of the only educational Hip Hop program in the nation offered as a regular class to middle and high school students. Sadly, due to ever-increasing budget cuts, the program will no longer have a home come June 2011. 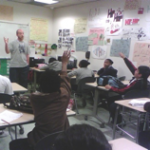 In 2007, Elkouby began working with the International Visitors Council of Los Angeles, advising educators from around the world on how to use Hip Hop culture as an educational medium. In 2008, the National Society of High School Scholars selected Elkouby as “Educator of Distinction”. Unfortunately, this wasn’t enough to prevent the program from being terminated.